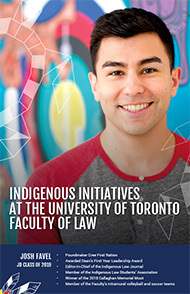 The University of Toronto Faculty of Law offers Indigenous students a world class law degree in a supportive environment via our Indigenous Initiatives Office. The Faculty of Law has a strong tradition of working to enhance the Indigenous voice in our community and within the legal profession more broadly. We proactively recruit Indigenous students for both our JD and Graduate programs and provide specialized support to Indigenous students to enable their success. We offer innovative courses in Aboriginal law, and host outreach and recruitment events specifically aimed at Indigenous students. The Faculty has one of the highest graduation rates for students of Indigenous heritage in the country. Our Indigenous students have gone on to leading positions at the bar, in the public service, and in the judiciary. The Faculty is dedicated to the success of Indigenous law students and provides support to students through the Academic Success Program, an academic mentoring program for all Indigenous law students who are experiencing academic difficulties or who wish to gain confidence in exam or paper writing. The Faculty offers free and confidential academic mentoring sessions (both in person and via email) and coaching. The Faculty of Law offers a wide variety of classroom and experiential learning opportunities to students who are interested in Indigenous issues. Students can compete in the Kawaskimhon Aboriginal Moot, work on the student-run Indigenous Law Journal, engage with Indigenous scholars and professionals with activities such as the Gladue Practicum Program and the Aboriginal Peoples and Canadian Law Practicum, and gain practical experience by participating in the Clinical Program with Aboriginal Legal Services. Students can also deepen their academic experience with the Certificate in Aboriginal Legal Studies. Fostering a sense of community and cultural belonging are important aspects of our initiatives. The Faculty honours the traditional territory of the Mississaugas of New Credit and welcomes our new students during Orientation Week with a welcome song by an Indigenous drumming group. A traditional Feast is held each fall, and includes all members of the law school community. Indigenous Alumni Mentors are available for all students, and sense of camaraderie and fellowship are created by joining the Indigenous Law Students’ Association. Our Indigenous application category is designed to identify exceptional students who will bring a broad and complex set of life experiences to the study of law. We strive to build a diverse and unique community of students who will forge lifelong friendships as they learn with and from each other. Indigenous applicants are requested to outline in their personal statements their interest in, identification with, and connection to their communities. Applicants can find more information about the process in the Application Procedure section. For further information contact the Manager, Indigenous Initiatives, at iio.law@utoronto.ca or 416-978-2583. 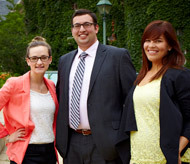 The Faculty of Law strongly supports the NLC Summer Program at the University of Saskatchewan. In appropriate cases, admission may be conditional on successful performance in the NLC Summer Program. Indigenous applicants who are given a non-conditional offer of admission are also eligible and encouraged to attend the NLC Summer Program. The program's Property law course satisfies the Faculty of Law’s first year Property law requirement; students who have successfully completed the NLC Summer Program will not take Property Law in their first year at the Faculty. Funding for the NLC Summer Program is available through the Legal Studies for Aboriginal People Pre-Law Bursary administered by Indspire. If students are unsuccessful in their application or ineligible for this bursary, the Faculty of Law may reimburse admitted Indigenous students who complete the NLC Summer Program accordingly: up to $2,700 for NLC Summer Program tuition, and up to $1,000 in reasonable housing, food and travel costs (original receipts required). Note that the actual amount students will be reimbursed will depend on the available funds for that year and student financial need. Please contact the Manager, Indigenous Initiatives for more details. For further information on the NLC Summer Program, see below. Indigenous applicants may also wish to find out more at the Indigenous Initiatives Office website. Check out the Indigenous Admissions Frequently Asked Questions. "I chose U of T Law because of all the law schools in Ontario, I felt it was where I would feel the most sense of belonging. Aside from its highly esteemed reputation, my impression of U of T Law was that it had a very strong Aboriginal law student community and that it is a school where Aboriginal law students succeed. When I arrived, my expectations were exceeded. The sense of community I experienced during the first month was more than I could have imagined."